Audio-Technica has debuted its BP894 MicroSet Subminiature Cardioid Condenser Headworn Microphone. Inspired by A-T’s popular BP892 MicroSet, the BP894 features a rotating capsule housing with talk-side indicator for use on either ear and perfect polar pattern placement. 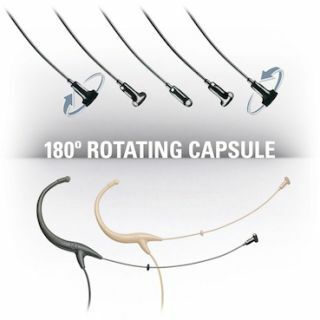 The MicroSet BP894 takes headworn microphones to the next level, by allowing the cardioid capsule to be aimed directly at the sound source (i.e. the microphone faces the mouth, rather than facing forward like other options on the market). The uniform pickup pattern provides excellent rejection of outside noise, with gain-before-feedback when used with live sound systems and stage monitors. Featuring an inconspicuous and ergonomic design, the BP894 MicroSet (available in black and theater beige) rests comfortably behind the ear and can be worn for hours without fatigue. Its contoured earpiece stays in place even on the most animated performer/presenter and does not interfere with the user's eyeglasses.